There is a theory that the more organized (read: developed) a society is, the less self-sufficient it becomes. All sorts of services and amenities, from housing to energy, from culture to justice, are centrally organized and distributed. But is that necessarily so? Or are we heading for a new order in which decentralized and self-reliant become the norm? The credit crisis made us more aware that we, as individuals, but also as global community, have new options to work with. There are new production technologies available, there are new ways for social interaction and collaboration, there are new ways to finance. The challenge now is how to connect these dots. 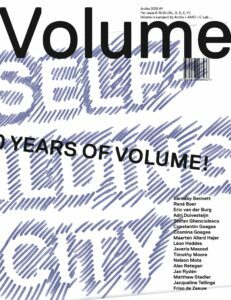 This Volume issue zooms in on housing and self-building as field of (inter)action. With contributions from: Barnaby Bennett, René Boer, Eric van der Burg, Adri Duivesteijn, Stefan Ghenciulescu, Constantin Goagea, Cosmina Goagea, Maarten Hajer, Léon Heddes, Javeria Masood, Timothy Moore, Nelson Mota, Alex Retegan, Jan Rydén, Matthew Stadler, Jacqueline Tellinga, Friso de Zeeuw.